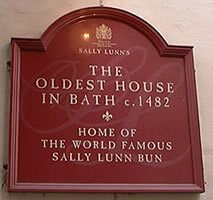 The oldest house in Bath is now know as Sally Lunn’s House, a picturesque building built in 1482 and located near Bath Abbey. The shop’s specialty for over 300 years has been the Sally Lunn Bun, a semi sweet bread made from brioche dough that tourists still purchase by the dozens to take home or eat on the spot in a small tea room setting. Sally’s history may be more lore than fact. Some say she was a young French woman who lived in the late 17th century and sold bread on the street for a baker. Eventually she found work in a kitchen and began making a bun with sweet or savory toppings that became famous. 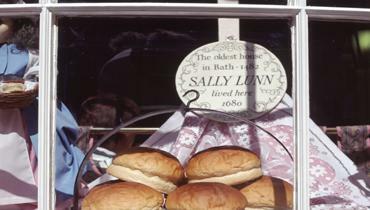 Others say that the bun was originally created in France, while still others claim that Sally was English and the daughter of a local pastry chef. Whichever is the case, the shop, wildly popular during the Georgian Era and open for breakfast and tea, still attracts customers in droves. 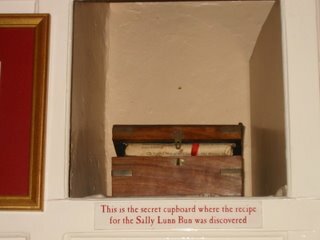 The orginal recipe of the Sally Lunn Bunn was discovered in the kitchen and was passed down along with the deed to the house. 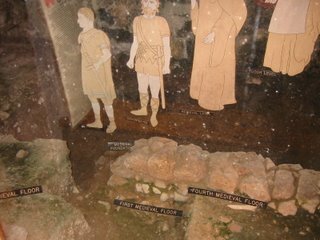 Today’s visitors can visit the cellar to see the Roman foundations (c. 200 AD) and medieval kitchen (c. 1150 AD). The building itself was erected in 1482, and the stone facade added in 1720. I’ve been to this house. The buns are served in a variety of ways. I ate mine straight from the oven with a savory topping and it seemed to melt in my mouth.